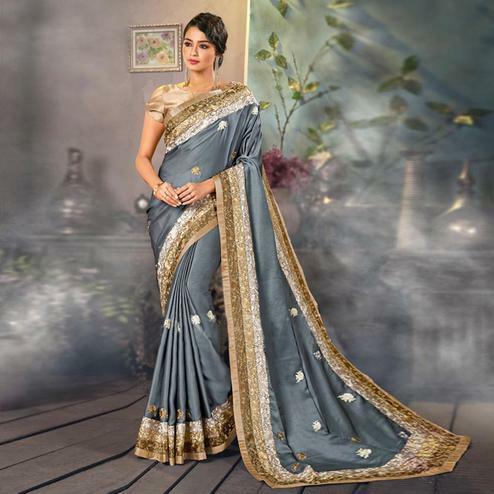 You look striking and stunning after wearing this grey and blue color knitting jacquard fabrics net heavy work jacquard border metal border saree. Its attractive color and designer heavy embroidered design, patch design, moti, cut paste design, beautiful floral design work over the attire & contrast hemline adds to the look. Comes along with unstitched raw silk blouse, which can be stitched as per your style and requirement. This saree would surely attract you showers of compliments when you wear it for parties, functions or occasions. Pair it up with classy accessories and heels to make your look more attractive. This designer saree won't fail to impress everyone around you.